The 2002 French presidential election consisted of a first round election on 21 April 2002, and a runoff election between the top two candidates (Jacques Chirac and Jean-Marie Le Pen) on 5 May 2002. This presidential contest attracted a greater than usual amount of international attention because of far-right candidate Le Pen's unexpected appearance in the runoff election. Chirac ran for a second term, emphasising a strong economy (mostly unaffected by downturns in Germany and the USA). It was widely expected that Chirac and Lionel Jospin, the then prime minister and candidate for the Socialist Party, would be the most popular candidates in the first round, and would thus go on to face each other in the runoff. However, Jospin unexpectedly finished in third place behind Le Pen. Journalists and politicians then claimed that polls had failed to predict Le Pen's second-place finish in the general election, though his strong stance could be seen in the week prior to the election. This led to serious discussions about polling techniques and the climate of French politics. Although Le Pen's political party National Front described itself as mainstream conservative, non-partisan observers largely agreed in defining it as a far right or ultra-nationalist party. As a result, almost all French political parties called for their supporters to vote against Le Pen, including the Socialists and many that had previously been opposed to Chirac. Chirac thus went on to win the biggest landslide in a French presidential election (greater even than that of Louis-Napoleon Bonaparte in 1848, the first by direct ballot), winning over 82% of the vote. The 2002 election was the first for which the President would be elected to a five-year, instead of a seven-year, term. In the months before the election, the campaign had increasingly focused on questions of law and order, with a particular focus on crimes committed by young people, especially those of foreign origin. Lionel Jospin was, at the time, Prime Minister of France; the Jospin government was criticised for its "softness" on crime by its political opponents. Alarmist reporting on the TF1 and France2 television channel and other media also overemphasised the alleged crime wave. The first round of the election (on 21 April), which saw an exceptional number of 16 candidates, came as a shock to many commentators, almost all of whom had expected the second ballot to be between Jacques Chirac and Lionel Jospin. Indeed, it was this very expectation that led to Jospin's downfall, with a plethora of "small party" left candidates (independent socialists and republicans, Green, Communist, Trotskyist, radical etc.) all intending to support him in the second round, but to raise their profile in the first, like Jean-Pierre Chevènement and Christiane Taubira. They cumulatively took enough votes away from Jospin to (unintentionally) prevent him from reaching the second round, which he could have won. 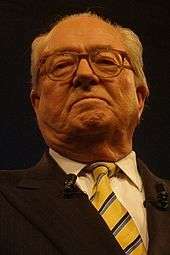 Instead Jean-Marie Le Pen faced Chirac in the second ballot. The election brought the opinion polls and two-round voting system into question as well as raising many concerns about apathy and the way in which the left had become so divided as a result of the over democratical refusal of Jospin to strategically ask the nearest small parties of his own government coalition to withdraw, like the preceding leaders of the left had done for such an election. Approximately 20,000 people turned out for the National Front's yearly demonstration in Paris in honor of Joan of Arc and in support of Le Pen. Between 900,000 (according to the Ministry of the Interior) and 1,300,000 people (according to syndicates) turned up to the Labor Day demonstrations and against the National Front. Hundreds of thousands of people who normally did not take part in such demonstrations came, in addition to the usual unions. In Paris, 500,000 people were seen in the streets, one of the greatest protest since the Liberation of Paris; the march was so big it had to be divided in three parts to reach the place de la Bastille. In another unusual sight for 1 May demonstrations, French tricolour flags were commonplace. The choice between Chirac, who was under suspicion for actions carried out whilst he was mayor of Paris (see corruption scandals in the Paris region) but benefited from Presidential immunity as long as he stayed president, and Le Pen, a nationalist often accused of racism and antisemitism, was one that many found tough. Some people suggested going to vote with a clothes peg on their noses to express disgust when voting for Chirac, but this may have been illegal, because it is prohibited to advertise one's vote inside the voting precinct. In the days before the second ballot, a memorable poster was put up of Chirac with the slogan "Vote for the Crook, not the Fascist". Chirac defeated Le Pen by a landslide. A response to the first round of elections, this spray-painted sign was seen on the streets of Paris. Translation: "April 21: I feel heartbroken". The 1 May 2002 Labour Day demonstrations for workers' rights included protests against Jean-Marie Le Pen. ↑ GARRIGOS Raphaël & ROBERTS Isabelle (23 April 2002). "L'insécurité, programme préféré de la télé" (in French). Libération. Retrieved 21 February 2012. ↑ Vincent Glad (29 September 2010). "Écarts entre les chiffres police/syndicats: record battu" (in French). Slate (magazine). Retrieved 21 February 2012. ↑ "Manifestation à Paris le 1er mai 2002 contre Jean-Marie Le Pen" (in French). Institut national de l'audiovisuel. 1 May 2002. Retrieved 21 February 2012. ↑ "Votez escroc, pas facho!" (in French). Libération. 23 April 2002. Retrieved 21 February 2012. Miguet, A. (October 2002). "The French Elections of 2002: After the Earthquake, the Deluge". West European Politics. 25 (4): 207–220. doi:10.1080/713601633. Wikimedia Commons has media related to French presidential election, 2002.